When the executive team of West Michigan’s Spectrum Health System, a 12-hospital network of more than 3,000 physicians and 30,000 employees, made the decision to implement PerfectServe’s secure care team collaboration system, Dr. Matthew Denenberg, who serves as Vice President of Medical Affairs (VPMA) of the system’s Helen DeVos Children’s hospital, said it was for all the right reasons. It wasn’t about being “cutting edge” or increasing the hospitals’ competitive share of the marketplace. The decision came from a shared understanding that it was time to move toward a direct and digital method of communication for the hospital network’s physicians because the old way simply wasn’t working anymore. In addition to his role as VPMA, Dr. Denenberg also serves as an ER physician. That puts him in the unique position of understanding firsthand the angst of hospital staff when facing archaic processes in times of real emergency. Like many systems of its size, Spectrum maintained paper schedules for all of its physicians. Contact information regarding who to call for any given reason resided either in a book or binder on someone’s desk, or within an un-automated and unintegrated copy-and-paste calendar application. If schedule changes needed to be made on the fly, instant updates were not an option. This resulted in wasted time and effort on the part of hospital staff responsible for patient care, which suffered due to communication delays. “We started seeing a rise in the number of event reports of delayed communications with physicians during time of patient need,” said Denenberg. It became apparent that the paper-based system was no longer appropriate in today’s era of direct and digital communications. The initial implementation of PerfectServe took three months to complete. By that time, nearly 50% of the Spectrum Health System’s 3,000 physicians were using PerfectServe regularly. Dr. Denenberg was charged with helping hospital leadership ensure physician adoption and became the project champion on an end-user level. He was able to walk away from the implementation and adoption stage with some powerful insights. For instance, to encourage early adoption by a larger number of physicians, Denenberg says hospitals should put serious thought and consideration into educating and training their staff on both PerfectServe’s browser-based and mobile app interfaces. Hospitals should also take measures to ensure that their technology infrastructure is sound. Making sure the Wi-Fi signals in isolated places —like inside the radiology suite or the campuses of rural hospitals — can support the technology will prevent gaps in communication workflows and encourage user adoption. Lastly, Denenberg suggests that hospital leaders spend quality time with different physician groups to understand their unique workflows and needs. For example, while PerfectServe’s HIPAA-compliant security measures prevent anyone other than the physician from accessing his or her messages on the app, one cardiologist had a standard practice of having his nurse read his messages aloud to him in the operating room while his hands were otherwise preoccupied — usually inside a patient’s chest. Now that Spectrum Health physicians are initiating up to 60,000 interactions a month through PerfectServe, the benefits have become evident. And with ease of communication comes high levels of staff satisfaction. Physician and staff satisfaction is of particular importance to hospital leadership. Arming nurses and doctors with the ability to provide patient care when the patient needs it most, from wherever the physician may be at the time, is one way to make sure everyone involved is more satisfied with their work. As an added bonus, using PerfectServe Synchrony has decreased the number of parties needed to maintain the hospitals’ complex physician schedules, which has led to a decrease in operational costs. Because PerfectServe has standardized the way Spectrum physicians communicate with providers and leadership, patient outcomes — in particular patient safety — have improved, as well. 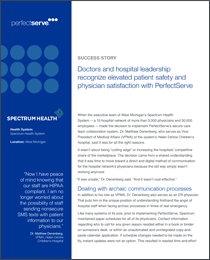 For Spectrum Health System, PerfectServe has decreased response times on average from 12 minutes to 4 minutes, eliminated confusion and inconsistency with maintaining call schedules, improved physician satisfaction and increased levels of patient care and safety. Spectrum Health is a not-for-profit health system, based in West Michigan, offering a full continuum of care through the Spectrum Health Hospital Group, which is comprises 12 hospitals; about 180 ambulatory and service sites; more than 3,200 physicians and advanced practice providers, including about 1,400 members of the Spectrum Health Medical Group.